Hey Doomies, it’s two weeks in a row for the first time in almost 10 years. Look at us go! First up is Avengers #12. I have always been kind of biased against Jason Aaron ever since he stole Van Jensen’s Wolverine story idea and then tried to make his case by denying what his story was about. Then I didn’t really care for him because he wrote the terrible Original Sin event. His writing has always felt to be the voice of the insecure—never quite confident to stand on its own, so it’s protected by the emotional safety net of knowing winks and chuckles. So I don’t know if he’s matured or if I’ve just softened, but I’ve overall enjoyed his run on Avengers. While talented people like Jonathan Hickman are capable of retconning beautiful elaborate histories, Aaron’s training-wheels kiddie version in this series has been earnestly endearing, with these ancient versions of modern avatars casting an interesting shadow over the relaunch of the series, no matter how unreasonable. The last few issues have been a little scattered, what with the rise of Angry Namor (I missed how he grew his head back after he lost it during the incursions a few years ago) and the cameos of Squadron Supreme (I haven’t paid attention to what they’ve been up to since they beheaded Namor a few years ago). It’s all led to some general Avengers distrust toward the U.S. government. 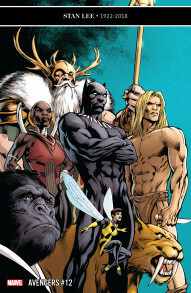 In this issue, we find Black Panther assembling a ground team to be his eyes and ears around the world. Part of what has been so charming in Aaron’s run is that he seems to be reaching for and normalizing some of the most fantastic and even silly parts of the Marvel Universe, but embracing what makes them ridiculous. For example, the Avengers live inside the corpse of a Celestial; their head of security is now a talking gorilla. It sure helps that Ed McGuinness is illustrating the thing (for the most part); he is one of the few artists who can execute a cartoonish style without compromising the gravity of a story, and his style is perfect for a story that reaches for and bear-hugs comics’ sometimes “wouldn’t it be cool if..?” ambitions. Unfortunately Ed wasn’t able to deliver this whole issue, and a backup crew of lesser artists supported him. 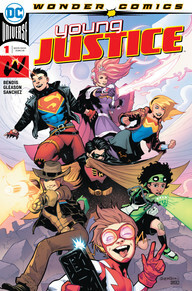 Speaking of surprises, I picked up Young Justice #1 on a whim. For all Brian Michael Bendis’ flaws, I think Ultimate Spider-Man was pretty fantastic, so I was curious to see how he did with these DC kids. I do appreciate a comic that just sets out to be all-ages fun. I hate to be wishy-washy, but I think it’s probably a little too early to have a strong feeling on this. I could see it going either way. There was fun energy here, but some of the contrived young-people dialogue was a little cringe-inducing, and Bart Allen is the worst. Apparently this was his big return to whatever the current iteration of the DC universe this is; definitely a missed opportunity to not make that clearer to people like me who were using this as a starting point. The villains were set up to be little more than jokes, but this issue really just set out to introduce the heroes’ personalities. I could see this succeeding as a fun book, so I do plan to keep following it. 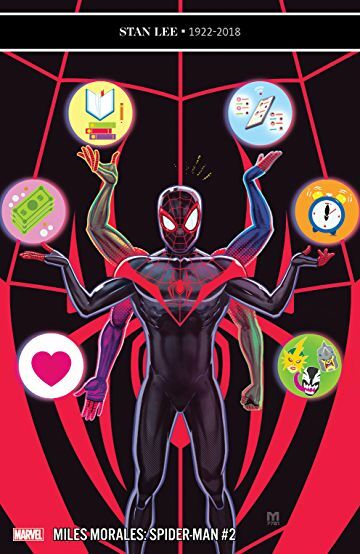 Speaking of the adventures of (writing) young people, I’m less hopeful for Miles Morales: Spider-Man #2. Some of the best fiction for young people doesn’t broadcast that it’s for young readers, but Saladin Ahmed can’t help but make it clear that this is a simple story for simple readers. Vulture had a great article around the release of Spider-Man: Into the Spider-Verse about how Miles is this beloved character, but can’t really get a good series about him. I was really hoping this would be different, but man, the allegories for racial discrimination don’t show a lot of respect for the reader. Miles is teaming with the Rhino, who is offended that Miles would just judge him and assume he’s a villain. On the surface, Ahmed seems to be speaking to what Miles experiences in his public life behind the mask. But really, let’s unpack this. Rhino is judged because he (by publication terms) has a few decades of being a notorious evildoer; Miles is judged by the color of his skin. It’s a questionable allegory, if not outright offensive. In fairness, I’m admittedly likely not the target audience for this, and if it resonates with young readers, especially those who have historically been denied representation in comics, then I’m legitimately excited about that. I’m not feeling it though. 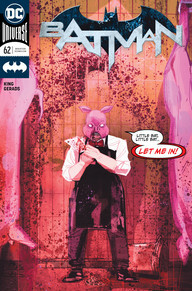 Speaking of not feeling it, that leads me to Batman #62, which involves a bunch of knife-throwing and therefore presumably some severed nerves. I was slow to hop on the Tom King Batman train, partially because I adored the Scott Snyder run and I didn’t feel like it was possible for anyone to top that. But secondly because there was that storyline early in King’s run where he had David Finch illustrating a story with some caped, super-powered Gotham heroes, and that turned me off big time. Finch is one of those products of 90s excess who imagines muscles that don’t exist piled on top of muscles, and I just can’t really stomach his work. Speaking of eagerly anticipating wherever we’re headed, that leads me to Uncanny X-Men #9. As I mentioned last week, I’m basically just reading this book believing that I’m just counting down the days to when they all die or something. Somewhere I swear – maybe in some solicitations? – that Cyclops and Wolverine have to pick up the pieces of some X-Men disaster. So really, just hoping everyone in issues 1-9 croaks soon. 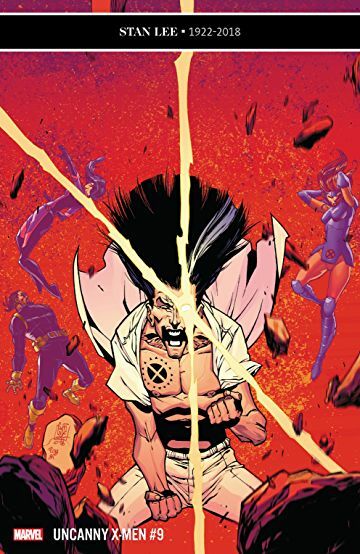 There’s really no better depiction of how lame the X-Men have gotten than the last page, when Beast tells X-Man-in-Legion’s body “If you want to beat the X-Men, you have to beat ALL the X-Men.” And then it’s the most pathetically drawn assembly of what is apparently all the X-Men. Because I believe in reinforcing the points I am making, I decided to count. There are 28 X-Men, and I only recognized about half of them. I realize this book has had to sacrifice art quality to hit its weekly schedule, but if I were Yildiray Cinar and I got the point where I was drawing Meggan and the page was still 50% negative space, I would’ve just started over. Speaking of wishing I could take back a decision, I don’t know why I keep getting suckered into this. So here we are at Green Lantern #3. More often than not, I hate everything I’ve read that Grant Morrison has written. The one massive exception though was his run on Batman that led to Batman RIP. And that was a big mystery (the story was a mystery, not that it was a mystery why I liked Batman RIP. Although not long ago I went back and read some of our old blogs on RIP and I had forgotten how it completely didn’t live up to the hype Morrison gave it, which was quite specific. Anyway…). 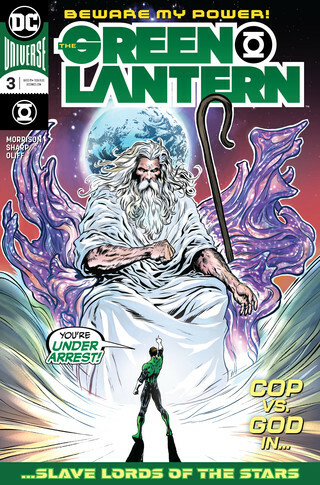 So when I heard that he was returning to relaunch Green Lantern but treating it as a cosmic police story, I had to admit I was intrigued. It took three issues for us to get to the point where Hal Jordan is in a boxing match with God. Not just punching—like with actual big green boxing gloves. In fairness to Morrison, underneath the ridiculousness, he seems to be telling a story of how power can compromise police, leading to abuses that undermine the structuralized morality of the role. And while I think there’s potential there, this feels a little like deconstructing Superman in “Man of Steel.” You gotta let this stuff build before you tear it down, man. It doesn’t help that Liam Sharp illustrates in that prototypical “British” style, where everything is inked in mud, clumped like it’s been photocopied 18 times, with no real sense of light direction—just hatch and shade everything wherever you can. I’m not kidding, when I was a kid and I’d see British comics (like Death’s Head), the inking looked so much like bad photocopying of a photocopy that I thought maybe it had something to do with how they shipped the art to America from England. It’s 2019, so surely they could fax it by now. Steve Oliff’s colors call back to the early 90s when computer-based color separations were just taking off, and all you could see were gradients everywhere you looked. This issue is best captured by a single line of dialogue. The Earth has been stolen from its orbit to be auctioned off to bad guys (this is before God purchases it). Because it’s no longer floating in space near the sun, there are all sorts of natural disasters happening and chaos has taken over the earth. The Justice League is shown comically just wobbling around a room – Batman, Superman, Aquaman, Wonder Woman, Martian Manhunter, Flash, John Stewart and Hawkgirl just all slightly off-kilter – when a blonde woman in a short nightgown-shirt who is never identified is on the phone with a man named Tom, who is trudging through snow. Worst of all, somehow this book ended up in my pull file. Considering Saladin Ahmed’s taking over a writer on Ms. Marvel in a couple of months, that review of the Miles Morales book is not encouraging. I bought the collection of Jason Aaron’s entire Ghost Rider run and enjoyed it pretty well, but I’ve never felt any urge to read any of his other stuff. Ghost Rider seems like a good book for his, “throw a lot of weird crap at the wall” approach. I will not be convinced that the “he” in the second sentence refers to Tom King instead of me. Open up! Copyright © 2019 Doomkopf.com. Proudly powered by WordPress. BoldR design by Iceable Themes.